Olecranon process fractures are relatively common fractures of the upper limb. They occur with a bimodal age distribution; occurring in the young following high energy injuries and in the elderly (more common) following low energy indirect injuries. In this article, we will look at the pathophysiology, clinical features, investigations and management of olecranon process fractures. The olecranon is the site of insertion for the triceps muscles. 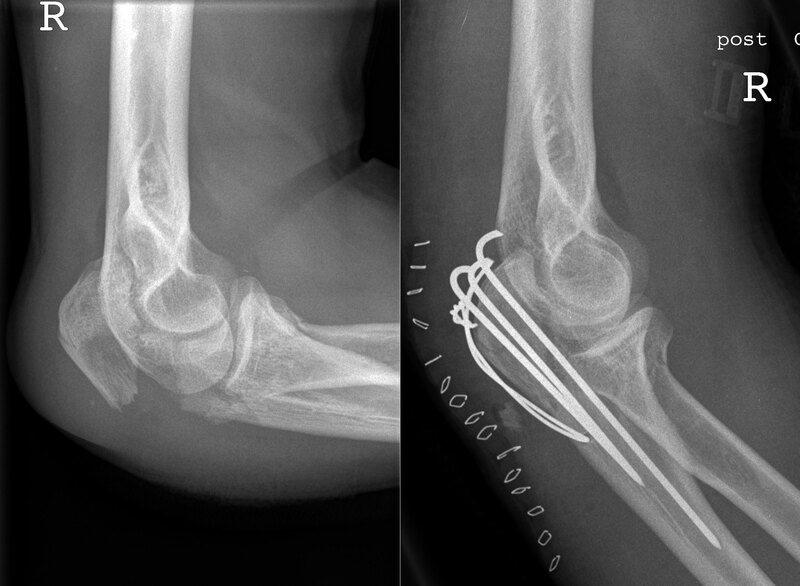 Fractures of the olecranon typically result from indirect trauma when a patient falls on an outstretched arm, resulting in the sudden pull of the triceps (and brachialis) muscle. The triceps muscle will also act to further distract the fracture; this is important to appreciate as it influences the management of these injuries. Less commonly, in younger patients, these are high energy injuries resulting from direct trauma and may be associated with other forearm injuries or fractures. 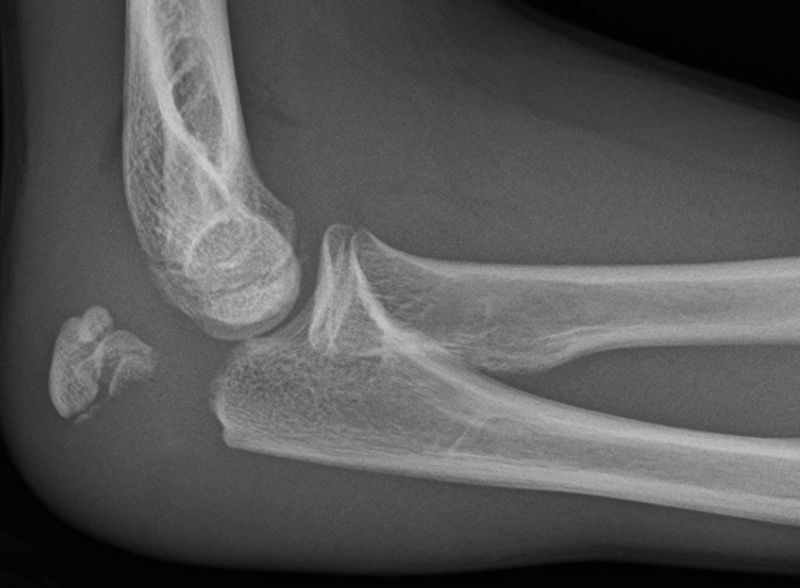 Olecranon fractures typically present with a history of falling on an outstretched hand followed by elbow pain, swelling, and lack of mobility. On examination, there is typically tenderness when palpating over the posterior aspect of the elbow, with a potential palpable defect also present. The disruption to the triceps mechanism means often there is an inability to extend the elbow against gravity*. Ensure to check the neurovascular status of the affect limb. Other injuries associated with a fall on an outstretched hand include wrist ligament and bony injuries, and radial head fractures or dislocation. Therefore, the shoulder and wrist joints should also be examined. *In minimally displaced olecranon fractures, extension is preserved (albeit tender) due to the soft tissue attachments that remain intact. All patients admitted should have routine blood tests taken, including clotting screen and group and save. Initial imaging should be via plain AP and lateral radiographs, of both the affected joint and potentially joints above and below too. Ensure the patient is resuscitated appropriately and stabilised, prior to definitive management of the fracture. Ensure to provide adequate analgesia. Treatment is usually guided by the degree of displacement on imaging. Any complex injuries such as fracture dislocations or neurovascular compromise should warrant urgent senior discussion. Which structure does the olecranon articulate with? In an olecranon fracture, which muscle displaces the proximal fracture fragment?